Posted: June 27, 2018/Under: Gaming, GFA, Misc. It’s over. The End has come.. There’s nothing left but dust, weapons, and mutants. Such is the life of the twelve mutants all set to risk it all to find this mythical, supposedly world-saving macguffin, the Nuclear Throne. The world of Nuclear Throne is a top-down shooter. Death is nearly permanent, as Nuclear Throne fits within the category of a Rogue-Light, where death is a swift boot back to the start with the loss of all upgrades and both weapons currently held. Each run for the throne is randomly generated, with level shape, enemy and item placement all being determined by an incredibly fast generation system. Of course, RNG can needlessly throw you into impossible situations sometimes, but more on that later. Level progression only comes upon defeating every enemy in a stage, with a portal opening over the corpse of the last enemy defeated. There’s no telling what the next stage will look like through these portals, nor is there any way to truly know even if you understand what stage you’re heading to. The level generation is constantly throwing out new things, but may re-use specific level bits here and there. Overall, each map feels like a brand new location even with these recurring sections. The journey to the throne is a long one, with four core worlds and three in-between spaces to buffer them. Expect to set aside 20 or so minutes to get to the throne. Each “world” has a specific design theme, such as a desert wasteland, a ruined scrap yard or the remains of a city stuck in nuclear winter, all of which consist of three stages, with the third stage ending with a world boss. After the boss is a single, more enclosed stage to act as a break of sorts between the more hectic main stages. But, these can be just as crazy as the regular stages in their own different way. They focus more on melee-based enemies and close-quarters combat when compared to the main firearm based enemies of the overworld. These stages are also individual from each other design-wise, such with the Labs having different enemies and visual design from the Sewers. There’s an additional option to skip the normal ending of the game and pull off what is called a “loop” instead. Pulling off a loop sends you back to the start to do all 15 stages over again, however with all of your mutations and weapons intact, and the added twist of several new enemy types being added in with the regular baddies of an area. Loops can be done as long as you’re able to stay alive and reach stage 7-3 again, although it is rare to get beyond a third loop as the enemy count reaches levels near impossible to manage. If not for this limitation, the game would technically be endless. Now, Crystal can Shield, Steroids can dual wield, and Robots can digest anything. Each of the twelve playable characters has two additional abilities, one active, and one passive that will change how each will make the trek to the throne, or die trying. Not all of these abilities are helpful though, as some act to counter an otherwise overpowered active ability, such as being able to dual-wield any two weapons all the time. From the previously mentioned abilities to things such as spawning allies, utilizing telekinesis, and firing off pure radiation, there’s no shortage of ways out of a tricky situation. But there’s also no shortage of ways to die. Be it standard bullets, lasers, or a freak combination of crystal and interdimensional rift, you’ll constantly be finding new, and dare I say intriguing ways for your runs to end. To aid the mutants on this journey, after the collection of so many rads, or radioactive material dropped from defeated enemies, your character will be able to mutate even further. Each mutation adds yet another layer of complexity to the game, allowing things such as a second life, or permanently slowing down all bullets fired by enemies. There are several others besides these, each aiding the mutant on their journey to various degrees. Knowing which mutation will be most useful for the situation at hand is half the battle, as these also reset upon death and are randomly put into pools of four upon each level up. There are also items known as “Crowns” that can be discovered in some secret areas, however these add an additional difficulty curve by tweaking the map generation, or how pickups such as ammo and health appear. Nuclear Throne excels with visual clarity, most of the time. In a fast-paced action title such as this, clarity is key, and Vlambeer has hit the nail on the head… Mostly. A few enemies in the game are specifically designed to be deceptive in their nature, blending in with the background, but sometimes enemies purely can’t be seen due to their small size. It’s a rare issue, but losing one of your precious health points due to a maggot you couldn’t see isn’t fun. The soundtrack and audio design is just, if not as important as the visuals. With 35 tracks, a few of which are also collaborations between individuals such as Disasterpeace, (FEZ, Hyper Light Drifter) Danny B. (Super Meat Boy, Crypt of the Necrodancer) and the original composer, Jukio Kallio. Each track contributes just a bit more to this journey, with the Drylands theme readying the player up for the upcoming challenges, and the Sewers theme reminding you that hope for this world may be lost, etc. The solid thump of the grenade launcher, or the quick dundundun from the Assault Rifle give a sense of power to each of the over 100 weapons that can show up as you move ever closer to the throne. Each enemy also has clear audio cues for attacking, taking damage or dying, allowing the player to eventually understand what they hit offscreen without having to expose themselves to fire. One could say it’s tough, but fair. I would agree with this up until the point where the game decides to give you a large, open space with no cover and no way to dodge the literal wall of bullets flying your way for no apparent reason. These types of situations are rare, thankfully, but the mere presence of them makes this game one best suited for quick sessions that end before you get too frustrated. Not even a quick-fire reset button is enough to convince me to continue playing after situations like this. I would advise looking into Nuclear Throne’s Game Jam Prototype, Wasteland Kings if you’re unsure about spending $12 on this game. It’s rough, but the general concept is there. Personally, I’d say it’s worth the $12 price, even with RNG being a pain sometimes. 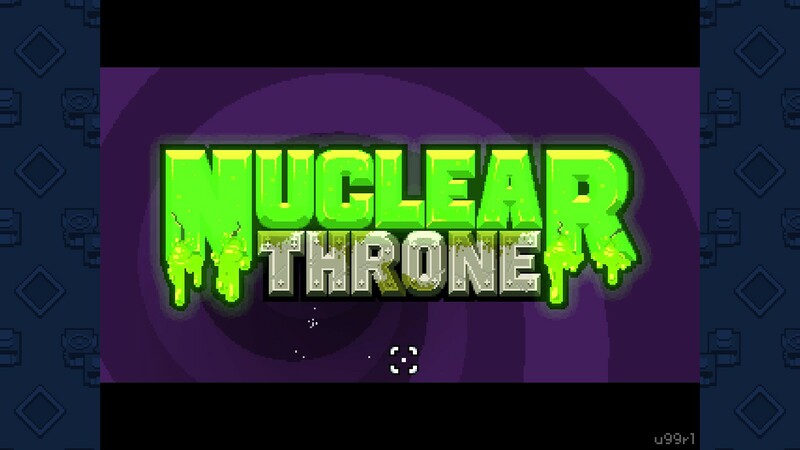 Nuclear Throne is a Good title, with a score of 8 out of 10.